If you are looking for cost effective retail sales training for you or your retail team then you have come to the right place. Finding quality retail training that is flexible and accredited can be quite a challenge. After all, you don’t want to spend days on end locked away in a training room and you want to be able to upgrade your skills as and when is most convenient to you and your business. The Retail Sales Academy provides end to end retail training to get you up to speed and selling effectively in next to no time. All of our sessions are delivered online which means that you can take them whenever and wherever you like. You can take them during down time in your store and no matter whether you like to learn on a desktop, a tablet or a mobile our courses are specifically designed so you can learn on whatever device you like. 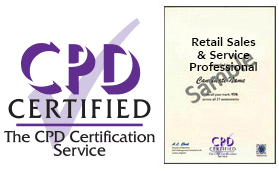 Our retail courses are CPD Certified. That gives you the peace of mind that the programme has been through a rigorous quality assurance process. There is a short online assessment to be completed at the end of each module with a pass rate of 70%. Once you have passed all of the assessments you will receive your CPD certification. If you don’t pass the first time you can take the assessments as many times as you need with no additional charge. All of our courses are interactive to keep your attention and are a mixture of presenter led training, online presentations, quizzes and exercises. And at the end of each session there’s a 1-page cheat sheet to walk you through exactly what you should do when it’s time to implement the training back in the workplace – after all, that’s when the real work starts! Nowhere on the web can you obtain such value as our training. Not only will you learn exactly what it takes to deliver a sales through service approach but you will also have a CPD Certification which is recognised worldwide. It’s incredibly easy to get started. All we need are some short details from you and you can be set up and have access to the materials in a matter of hours.